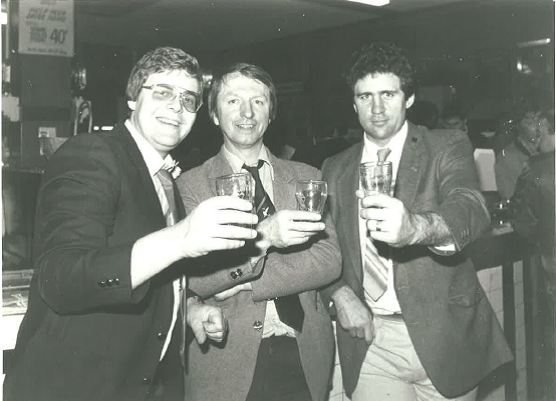 Ray Fletcher (centre) enjoys a XXXX off the wood at Brisbane’s Breakfast Creek Hotel in 1984, with Andrew Varley (left) and Steve Ricketts after the British league crew were hosted to lunch at Valleys club, Neumann Oval. One man who was absolutely devastated at not being able to make it to the 2013 Challenge Cup final at Wembley is Leeds based, Raymond Fletcher. Ray is a Hull man through and through, and one of the most dedicated rugby league men in the world. A long time league correspondent for the Yorkshire Post, Ray has been in semi-retirement for some years, but of late has not enjoyed the best of health. Like most league people, he regards the 1985 Wembley final between Hull and Wigan as one of the classics, even if the ‘wrong team’ won. I first met Ray on the 1982 Kangaroo tour of Britain, although I believe our paths crossed in 1979 when he covered the Great Britain tour of Australia. At that time I was still playing league – with Norths in Brisbane – but my only league journalism was as a contributor to the BRL programme. I switched from the general news section to sport at The Telegraph in 1981 and as a rookie sports writer in ’82 fully appreciated the help Ray gave me while based in Leeds. We met regularly at the Scarbrough Pub for a chat, or I would go to his place for tea and scones, thanks to his wife, Muriel. Ray and young photographer, Andrew Varley covered the 1984 Great Britain tour of Australia and we travelled together to games from Sydney to Rockhampton, from Toowoomba to Tamworth. 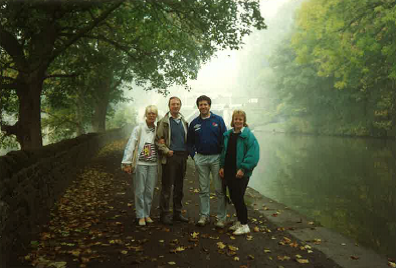 Our paths have crossed many times since, even extending to Ray and Muriel hosting my Mum and Dad in their lovely Leeds home in 1994 after my parents were part of my first ever supporters’ tour to Europe. Ray combined with prominent England league official, David Howes to produce the widely read Rothmans Year Book, the ‘bible’ of the code in the northern hemisphere. Ray is much a part of Leeds as the Whitelocks Pub, Headingley and the River Aire. But Hull is his home town and Hull FC his team. Hopefully there are many good times ahead for Ray and for Hull.